Sanam is a trained Molecular Pharmacologist. She completed her undergraduate studies at the University of Glasgow, graduating in 2004 with a M.Sci (Honours) in Genetics. She has trained in some of the world's leading laboratories researching G protein-coupled receptors. Her prestigious PhD studentship was co-funded by the Biotechnology and Biological Sciences Research Council and GlaxoSmithKline. Following postdoctoral positions with Almirall and Prof Kevin Pfleger's group at the University of Western Australia, Sanam moved to the University of Adelaide. Working with Prof Mark Hutchinson's Neuroimmunopharmacology group and the Australian Research Council Centre of Excellence for Nanoscale BioPhotonics (CNBP), she has widened her research interests to include neuroimmunology. In a transdisciplinary team, Sanam works closely with physicists and chemists within the CNBP. 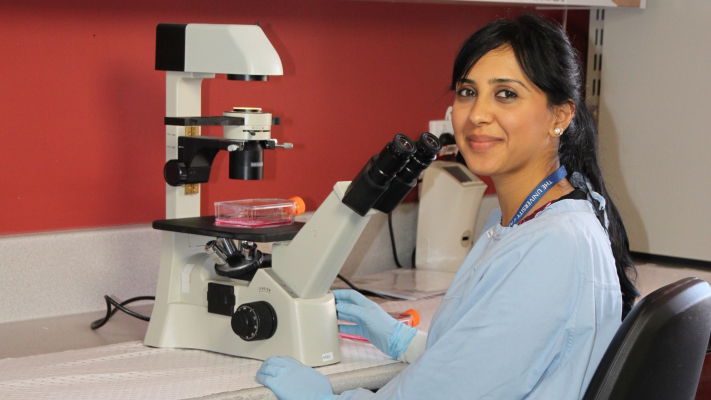 Sanam brings her wealth of experience to her unique position to develop novel tools for sensing and investigating intracellular signalling. Sanam thanks her inspirational mother for teaching her the importance of education and encouraging her to take the first steps towards the career that she now has. Recognising that not everyone is as fortunate to have such support from home, Sanam strives to encourage young females to aspire towards a future in STEM careers.